Golf once again proved its feasibility by releasing the all new Volkswagen Golf GTE 2015 at the Geneva Auto Show 2014. With its new release Volkswagen is on its way to bridge the gap between its GTI and e-Golf by taking traits from both. 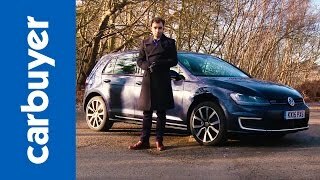 Let us have a close look at the review of Volkswagen Golf GTE 2015 and get to know, what all company has to present with this plug-in hybrid. Interior of Volkswagen Golf GTE 2015 begins to mark the entity with a three-spoke flat bottom steering wheel mounted with functions. Steering wheel with gear shift knob, floor mats and seats get the accent of blue stitching, the essence being derived from the GTI which had red in its interior. The accents of blue stitching get further accompanied by ambient lighting in blue, which make the entire interior look luxurious and sportive. 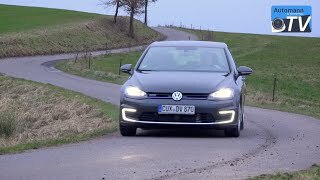 Talking about the technological advancement and features integrated inside Volkswagen Golf GTE 2015 you have a 6.5 inch touchscreen housed with range monitor, energy flow display, zero emission statistics and e-manager. Each of these above mentioned features commendably play their part in making the interior worth a stay. 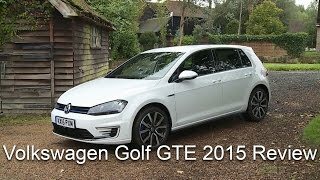 Exterior of Volkswagen Golf GTE 2015 is just the perfect amalgamation of GTI and e-Golf. The hatchback looks surprisingly gorgeous. Starting with the front fascia we have dual LED headlights above the c-shaped daytime running lights. Borrowing from GTI you’ll notice spoiler at roof edge and side skirts while the front and rear lights mark its roots in the e-Golf version. This entire merger rolls over the 16 inch aluminum alloy wheels giving its buyers an option to go for either 17 or 18 inch wheels. 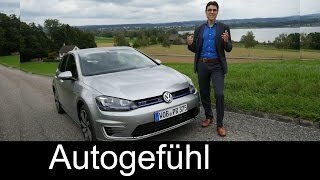 In all rounding up the exterior of Volkswagen Golf GTE 2015 you have a perfect hatchback offering features from one of the best presented by company. The Volkswagen Golf GTE 2015 beneath its hood hides a 1.4 Liter TFSI engine delivering 148 hp and an electric motor producing 101 hp of output. This entire circuit combines and thus produces total output of 201 hp and peak torque of 350 nm mated to six-speed DSG transmission. 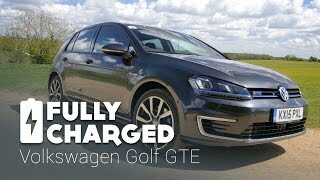 With these power figures the Volkswagen Golf GTE 2015 car reach top speed of 135 mph while the 0-62 mph sprint gets knocked in just 7.6 seconds.